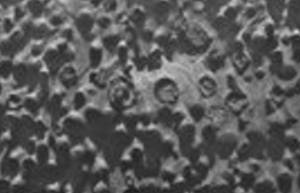 A strange picture of odd, spherical rock formations on Mars from NASA's Opportunity rover has scientists scratching their heads over what exactly they're looking at. The new Mars photo by Opportunity shows a close-up of a rock outcrop called Kirkwood covered in blister-like bumps that mission scientists can't yet explain. At first blush, the formations appear similar to so-called Martian "blueberries" — iron-rich spherical formations first seen by Opportunity in 2004 — but they actually differ in several key ways, scientist said. "This is one of the most extraordinary pictures from the whole mission," said rover mission principal investigator Steve Squyres of Cornell University in Ithaca, N.Y., in a statement. "Kirkwood is chock full of a dense accumulation of these small spherical objects. Of course, we immediately thought of the blueberries, but this is something different. We never have seen such a dense accumulation of spherules in a rock outcrop on Mars." The new photo by Opportunity is actually a mosaic of four images taken by a microscope-like imager on its robotic arm, and then stitched together like puzzle pieces by scientists on Earth.